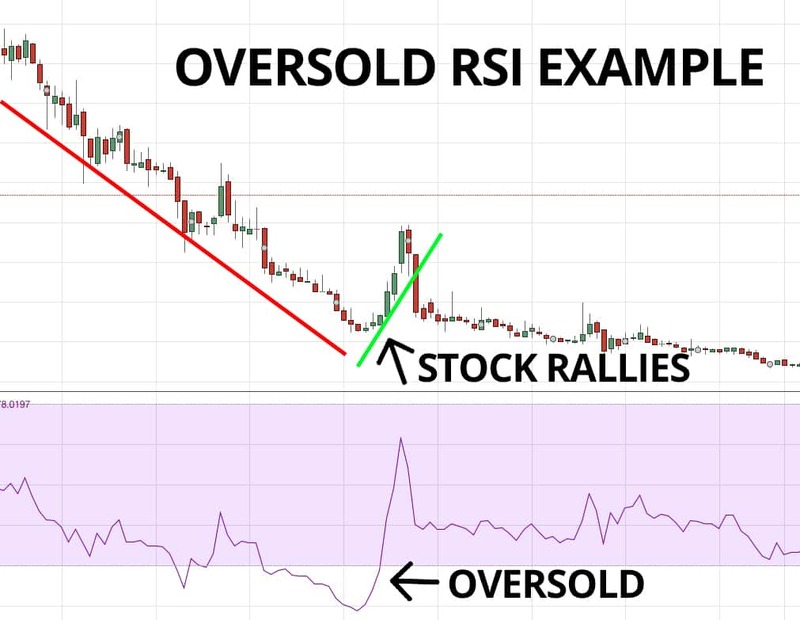 A stock is considered to be overbought when the RSI is above 70 and oversold when the RSI is below 30. The Relative Strength Index (RSI) is a momentum oscillator used to gauge the current overbought or oversold condition of a financial instrument on a scale of 0 to 100. 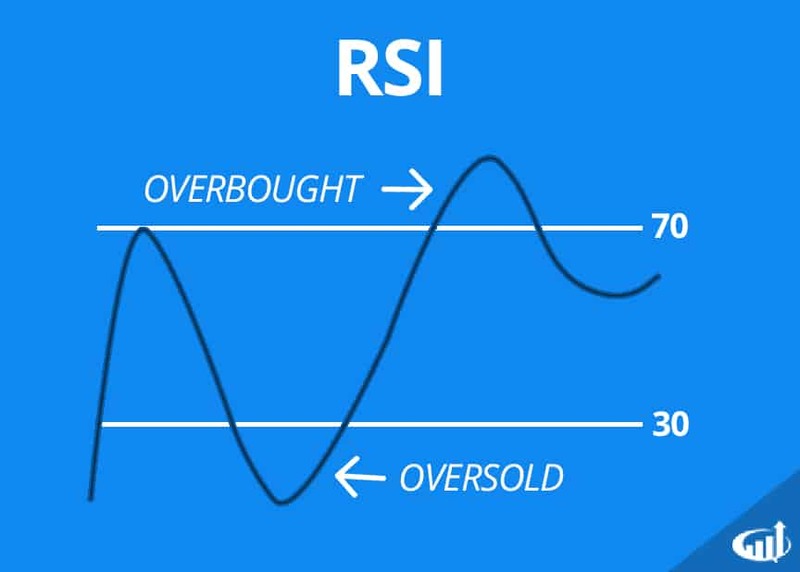 Prices are considered oversold when the RSI falls under 30 and overbought when RSI rises above the 70. The formula is RSI = 100 – 100/(1+RS). The RS is relative strength, which is calculated by dividing the average closing price of the up closes by the average closing price of down closes. The formula is RS = Average Gain/Average Loss. Momentum is the velocity and magnitude of price rise and falls. The RSI measures how robust the price momentum is currently. It indicates when the momentum is slowing down or picking up steam by comparing to prior momentum. The most commonly used setting for RSI is 14 length and Close of the period. This is the recommended setting by creator, J. Welles Wilder. The oscillator can be used to buy when it bounces back up or off the oversold 30 band or to sell/short sell when it falls back under or deflects back down off the overbought 70 band. Typically, the RSI oscillator will rise when the underlying stock price rises and fall when stock prices fall. A divergence signal forms when the RSI and stock prices move in opposite directions. When the stock (or any financial instrument) price is rising but the RSI oscillator is falling, it indicates that a reversion drop is impending. When a stock price is falling while RSI is rising, it indicates a reversion bounce is impending. This is best used when new highs or lows are being made in the underlying stock and RSI is at or beyond the 70/30 overbought/oversold bands to generate a more robust reversion/reversal. As the stock makes new highs, RSI should also be making higher peaks. Divergence signals when the RSI starts to form lower high as the stock makes new highs. The RSI is indicating the momentum is slowing down and an impending reversion sell-off is nearing. Trendlines clarify instances of divergence more clearly. During an uptrend, it helps to draw trendlines connecting the higher highs on the stock and the higher highs on the RSI to idtify when a divergence forms. During downtrends, draw trendlines connecting the lower lows on the stock and lower lows of the RSI. The buy triggers form on bounces back up through the 30 band and sell/sell short triggers form when RSI falls back under the 70 band. As with any indicator, nothing is 100% in the markets. Strong uptrends can signal multiple bearish divergences before a material reversal may set in and vice versa on strong downtrends. Most charting platforms include the RSI indicator for charts. Be sure not to confuse with a Stochastic RSI or Relative Strength, as these are different indicators. The RSI can be combined with other indicators like moving averages, trendlines and chart patterns to galvanize a trading system.